A few years ago Marie Kondo’s book “The Life Changing Magic of Tidying Up” became a huge hit, inspiring readers around the world to simplify and declutter their homes. Her mantra is “spark joy”— she urges people to purge their possessions and keep only those things which give them joy. Suddenly conversations with friends and strangers included references to Kondo’s philosophy. While it was clear people resonated with her approach to simplified living, not everyone could abide by her methods. “I just can’t imagine pulling everything out of my closet and sorting through it. It would be overwhelming,” my mom told me. I’m thinking about this again as the new year unfolds—and Kondo has a new Netflix series showing how she helps clients declutter. As I watched a few episodes, I decided, maybe this is the year I cull my books, which have overflowed into waist-high piles next to the bookshelves. Maybe this is the year I get rid of the excess flower vases, dinner napkins and bath towels crowding my closets. When I’ve done this in the past, not only does it create space, but it lightens my mood. I feel less burdened by my stuff. The act of decluttering—if I can follow it through to the end—brings me joy. My friend Ana would agree. As a professional mover, she is the poster child for decluttering. She and her husband move families all across the U.S. Inevitably, Ana arrives at a house and gets pulled into the final stages of packing. After years of doing this work, she’s become an expert at helping people part with their excess stuff and take it to Goodwill or the dump. Ana and her husband live the most pared down life possible. When I visited them a few years ago I noticed there were almost no knickknacks, no books and no videotapes on the shelves. Ana lived with few possessions and was proud of it. Two years ago, when Ana’s son left for college, she and Will moved out of their townhome and now split their time between their truck cab (complete with kitchen and bed) and their sailboat. Perhaps their spartan lifestyle isn’t for everyone, but having few possessions seems to bring them a lot of joy. Maybe–unlike Ana–I’m really a Marie Kondo “lite” person. I like decluttering to a point. But I have to admit that I also like a certain amount of stuff. I like the fact that I still have two thick volumes of “Early Netherlandish Art” from college. Seeing them brings me joy as I remember the pleasure of learning about art every week in a darkened lecture room. 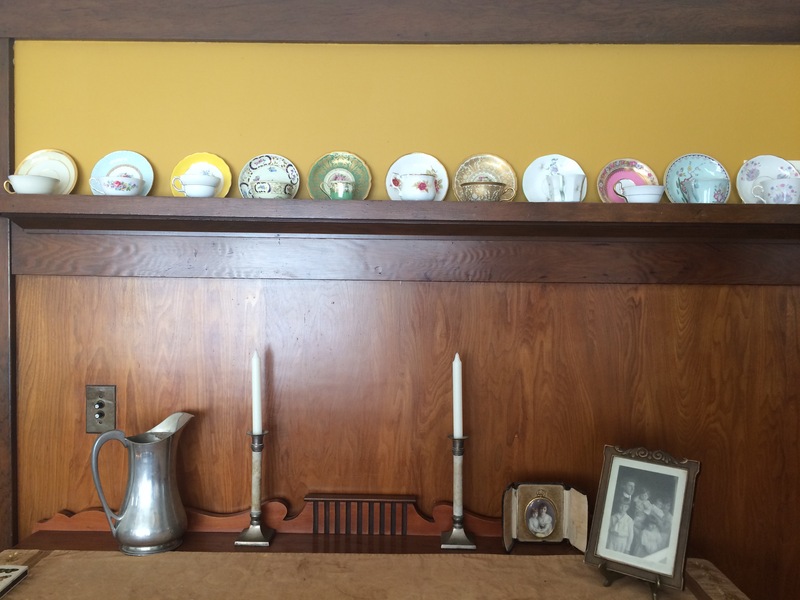 I like my collection of 32 tea cups lining my dining room. I rarely use them but many people ask about them and I enjoy telling them the old ones came from Peter’s aunt Totsie and the newer ones were engagement gifts. Not many people know that tea cups were once traditional engagement presents. Other stuff I have brings me less joy. 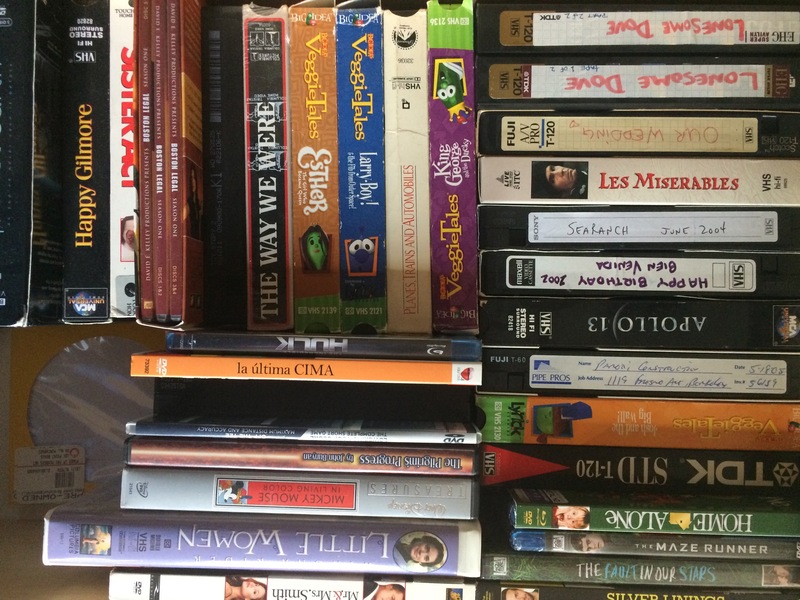 We have drawers full of kids’ DVDs and VHS tapes. I am saving these out of nostalgia and maybe for grandkids. But by then they will be obsolete. 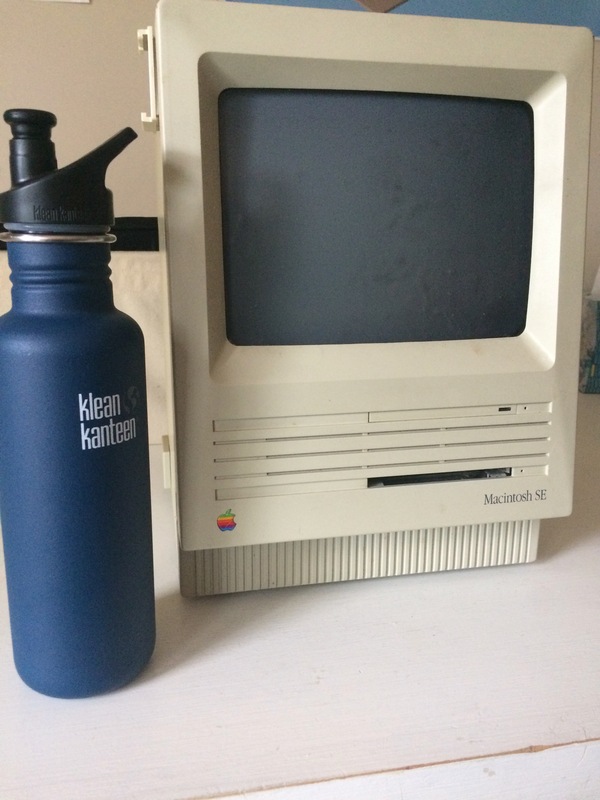 I’ve saved other sentimental items—like my first Mac classic computer, circa 1987. It’s so cute and retro with it’s cube-like case. When I turn it on, a watch appears and the hands turn and turn. I can’t part with it, but in the meantime it’s gathering dust. And then there’s my kitchen utensil drawer, filled with items like a tool for de-skinning grapes and a device for de-pitting cherries. These mostly bring me frustration as they make it harder to find the really tools I want. The hardest part of giving away stuff is the notion you just might need it someday. How do you decide? Organization experts say you should give away clothes you haven’t worn in a year. On the face of it, this makes sense. Yet, from time to time I think of outfits I’ve given away that I wish I had now. I remember the midnight blue silk dress I wore to my wedding rehearsal dinner party. I thought it was out of style when I gave it away but now it seems to be back in style. I think of the loose-fitting pleated chinos I wore in Europe in 1993–also back in style, according to my son who recently saw a photograph of me wearing them. I know Marie would probably say that these items are not the thing to be treasured—we really should treasure the memories. But I sure would love to wear those outfits again. My parents have saved an extraordinary amount of stuff. Although in recent years they’ve done a good job of purging things—so, my mom says, I won’t get stuck with them—their big house means they can store a lot. It strikes me that Marie Kondo’s clients in Japan probably didn’t have the space to store an old ping-pong table like my parents did. I doubt the table brought my parents a lot of joy sitting in their garage all these years. It hardly got used. According to Kondo, they probably should have given it away. But recently my son noticed it and asked if he could bring it to our house. Now the boys use it a lot and it feels like we got free money. More recently, I wanted to put up a small Christmas tree in our family room (in addition to our large tree). Of course, my mom had an extra one. I could see her smile (even though we were talking on the phone) when she excitedly told me I could have it. In contrast to my parents’ generation and mine, I’ve been told that millennial aren’t interested in accumulating stuff. They may never own homes. They may live more transitory lifestyles. They don’t want Grandma’s Royal Dolton collection or Aunt Betty’s antique table. These things not only take up space but they are outside of the trend toward sleek, modern design. Maybe millennial will never need to practice decluttering at all because they are already living as minimalists. I’m heartened that at least the next generation seems to be more aware than I was. My kids, for example, love buying clothes at thrift stores. It’s cheaper and more fun and it’s a form of recycling. As for me, I live in a somewhat spacious house and I’m not going anywhere soon. How do I achieve a balance between living more simply but also keeping what I really want and need? Could I live more lightly this coming year? I know people who have made new year’s resolutions not to buy a single piece of new clothing for the whole year. Or they only buy something if they give away another thing in their house. There’s a deep spiritual component to this, both in preserving the earth’s resources and deemphasizing material accumulation. To passionately follow this way of life goes against our consumer culture, with its fast fashion and throwaway lifestyle. Maybe the first step is awareness. I’ve lived in the same house for 20 years. While my volumes of “Early Netherlandish Art” spark joy many other books do not. I can create more space in my house. Maybe someone else will get joy from those books. Maybe purging will give me better space to think and better creative flow. Maybe each year I’ll purge just one new category—this year I’ll start with books. And I will think more carefully about new purchases. I think Marie Kondo would be pleased. Postscript: Since first starting this post, I’ve packed up three boxes of books to give away. I also cleared out three vases (out of 10) I never use. My mom wanted one of them! On the flip side, it looks like we’re keeping the 1979 MG we’ve been hoping to sell for three years. It did not bring us a lot of joy trying to keep its delicate British engine running. But my son just got his permit, figured out what it needed and loves it. Maybe next he can fix my Mac. 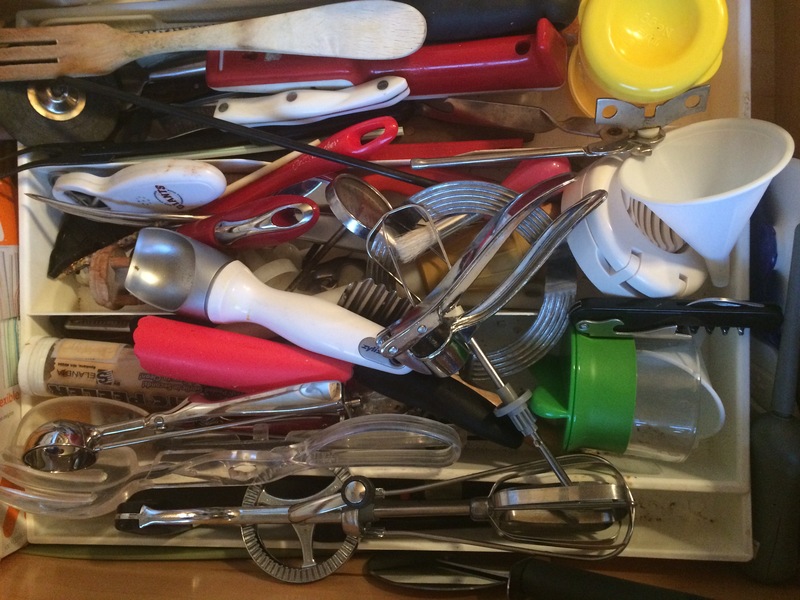 This entry was posted in family, Uncategorized and tagged "The Life Changing Magic of Tidying Up", decluttering, Marie Kondo, moving, simplifying, tidying up by Allison. Bookmark the permalink. Trends come & go. I was told there was a time people destroyed Tiffany stained glass windows because modern art & design were the latest & greatest thing. That passed & country style came in with the bicentennial. That passed & modern is back in. I think ithings will continue to cycle over & over. Obviously most of us can’t (& shouldn’t) keep everything. A moment comes when we are finished with objects. Things can become boring, useless & obsolete. It can become a burden to keep things. I have a lot of old photos from my Grandparents for instance. Sometimes I wonder why I am the keeper of these but not so much I want to get rid of them. It would just feel wrong on some level. I too have a lot of books. I love them. I try to get rid of them from time to time. I have a box to bring to the local library for their used book sale in two weeks. I can part with many things, when I am ready & it makes me feel responsible to do so. Sometimes (like you) I have regretted parting with some of it. I may be sentimental but I enjoy seeing things from my past. It connects me to a time & place, people & memories. I am Okay with it.